Welcome to Costa Daurada - the newest and most exciting golf destination in Spain! On this website you will find all the information you may need for your upcoming golf holidays! This beautiful coastline just south of Barcelona offers 7 golf courses, a wide range of quality accommodation, great weather and complete holiday packages at very competitive rates! To summarize - this is the new golf destination you have been waiting for! So don't hesitate. Explore these pages and come down and enjoy the golf on the Costa Daurada. It's just great! 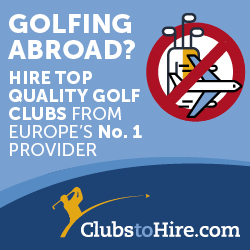 When you have found something you are interested in it's very easy to book your next golf holiday. First, check out our Special Offers and if you want to go ahead and book a golf trip you just fill out our Booking Form and our multi-lingual staff will get back to you with a confirmation. And if you don't know where to go - just send us an e-mail and we will help you find the hotel and courses that are best for you! You are always welcome to Costa Daurada! why choose Costa Daurada for your next golf trip? This is the official website of the Costa Daurada Golf Association. We promote, package and sell golfing holidays to Costa Daurada! Costa Daurada Golf Association consists of 7 golf courses and 9 hotels focused on providing a first class golfing holiday for you.